Sunday April 14, 2019 2:00 p.m.
"Jesus Christ Superstar" is a 1970 rock opera that is a global phenomenon. It has wowed audiences for over 40 years. 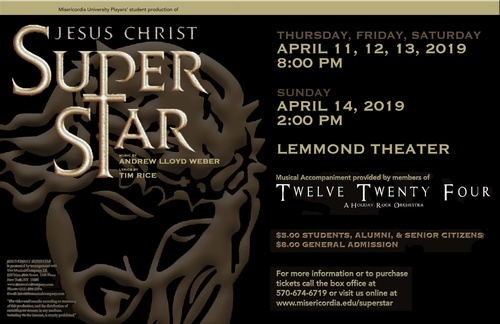 This is your opportunity to see the Misericordia University Players' student production of this well-known play. See attached flyer for complete details including admission prices and licensing acknowledgements to The Musical Company, LP.